New computational and experimental approaches to social science present both opportunities and challenges. These approaches can provide new and more robust insights on several important social phenomena, but they require crossing many methodological and technical boundaries, including those that have been established most recently. 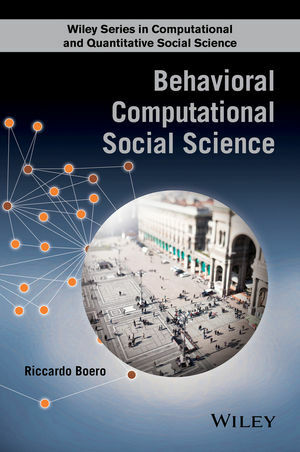 Behavioral Computational Social Science presents a comprehensive framework that couples behavioral analysis with the advanced modeling features typical of computational social science. The methodology presented allows the extension of the analytical power of the single tools composing it and provides a consistent approach for investigating the different components of the mechanisms explaining social phenomena. • Introduces the most recent methods for behavioral analysis and computational modeling in social sciences. • Presents the combined usage of both behavioral analysis and computational modeling tools, along with detailed descriptions of how to combine the usage of these tools. • Highlights the advantages of the conjoint approach and explores the issues that researchers have to face using state-of-the-art references and examples. • Provides guidance for readers who are new to behavioral and computational tools, while also providing invaluable information for experts in the field. This book enables the reader to effectively integrate behavioral analysis and computational modeling in social science research. Graduate students and researchers interested in enriching their analytical toolset will benefit from this book. The example model presented in chapter 8 is available here. 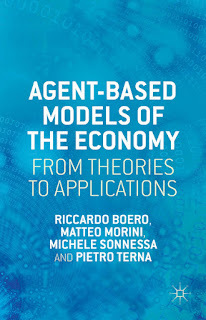 Agent-Based Models Of The Economy uses agent-based models for understanding a broad spectrum of economic phenomena. This book aim is twofold. First, it introduces the reader to the methodology and to the technicalities and the tools necessary to master the creation of agent-based models. Second, it presents several examples of applications to different economic phenomena where agent-based models are crucial in answering the research question and in solving practical problems emerged in business and policy domains (e.g., financial markets, cooperation dynamics, public policy evaluation). With this book, readers learn what agent-based models are and the advantages they can provide. Further, readers learn how to develop from scratch and with scientific rigor their own agent-based models for studying economic phenomena. Finally, readers find in the book several applications that can represent examples to be imitated and to be kept as reference. Climate change can induce changes in the frequency of severe weather events representing a threat to socio-economic development. It is thus of uttermost importance to understand how the vulnerability to the weather of local communities is determined and how adaptation public policies can be effectively put in place. We focused our empirical analysis on the American Southwest. Results show that, consistently with the predictions of an investment model, economic characteristics signaling local economic growth in the near future decrease the level of vulnerability. We also show that federal governments transfers and grants neither work to support recovery from and adaptation to weather events nor to distribute their costs over a broader tax base. Finally, we show that communities relying on municipal bonds to finance adaptation and recovery policies can benefit from local acknowledgment of the need for such policies and that they do not have to pay lenders a premium for the risk induced by weather events. In conclusion, our findings suggest that determinants of economic growth support lower vulnerability to the weather and increase options for financing adaptation and recovery policies, but also that only some communities are likely to benefit from those processes. Gender differences in reputation building and cooperative behavior are investigated in our last neuroeconomic study just published on PLoS One. control network (engaged in strategically resisting the temptation to defect) and the mentalizing network (engaged in thinking about how one is viewed by others), in which the dorsolateral prefrontal cortex (DLPFC) and the medial (M)PFC respectively play a crucial role. 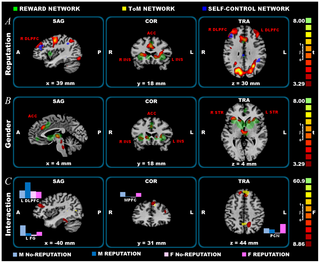 Furthermore, both DLPFC and MPFC activity correlated with the amount of back transfer, as well as with the personality dimensions assessed with the Big-Five Questionnaire (BFQ-2). Males, according to their greater DLPFC recruitment and their higher level of the BFQ-2 subscale of Dominance, were more focused on implementing a profit-maximizing strategy, pursuing this target irrespectively of others' judgments. On the contrary, females, according to their greater MPFC activity and their lower level of Dominance, were more focused on the reputation per se and not on the strategic component of reputation building. These findings shed light on the sexual dimorphism related to cooperative behavior and its neural correlates.